SSE says its performance in the first five months of the financial year was "disappointing" and "regrettable". It blamed "relatively dry, still and warm weather" - lowering output from its wind farms and hydro-electric stations - and "persistently high gas prices". As a result, profits for the six-month period, would be "around half" that of a year earlier, it said. The shares fell 8% to £11.50. Alistair Phillips-Davies, SSE's chief executive, said: "Lower than expected output of renewable energy and higher than expected gas prices mean that SSE's financial performance in the first five months has been disappointing and regrettable." 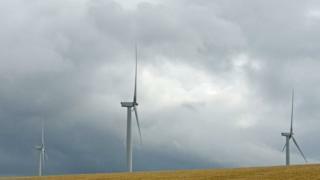 The trading update follows its announcement in July that first-quarter profits would be £80m lower than expected after the recent hot weather affected its wind turbines. In the statement on Wednesday, it said profits for the five months so far would be £190m lower than expected. This meant six month profits, for the year to the end of September, would be around half of that in the same period a year ago. SSE also said its retail arm would be affected by the cap being proposed by energy regulator Ofgem on default tariffs. Earlier this month, Ofgem proposed an energy bill price cap of £1,136 a year for "typical usage" by the end of the year. SSE said this would lead to "significantly lower" profits than it had expected at the start of the financial year in its retail arm and pointed out that unlike other energy suppliers it had only raised prices once this year. The retail arm of the company is in the process of merging with Npower, another of the UK's "big six" energy suppliers, and its results will not be included in SSE's earnings per share calculation for the full-year period. Mr Phillips-Davies said he was "very pleased" that the Competition and Markets Authority was clearing the way for the deal. "Reshaping and renewing the SSE group will support the delivery of our five-year dividend plan in the years ahead," he said. The promise on the dividend would "sugar the pill" of the profits warning, George Salmon, equity analyst at Hargreaves Lansdown said. "While most of us enjoyed day after day of blissful sunshine earlier this year, it wasn't such a great summer for SSE. Hardly any rain or wind meant output from its hydro and wind assets wilted in the heat, and with nobody putting the heating on, customer meters just didn't tick over," said Mr Salmon. "All the while, the price of gas in the wholesale market has kept rising," Mr Salmon added. The company set out how the £190m hit to profits had occurred: just under half was caused by higher than expected gas prices with the weather causing most of the rest. The wholesale arm, which generates electricity and stores gas, would report an operating loss for the first half, the company said.